THE ROUTE 66 WAS FIRST EXPLORED BY CAMEL-BACK ! One of the earliest known large scale explorations of the american south west was by Beale's Camel Corps, an experimental Army mounted division who's purpose was to explore the use of the camel for the US army. Their explorations from Arkansas to Los Angeles and also to Texas followed parts of what is today the ROUTE 66. Eventually these animals were sold into attractions and farms in the areas in the south west and became a big part of the entertainment industry in the western United States. 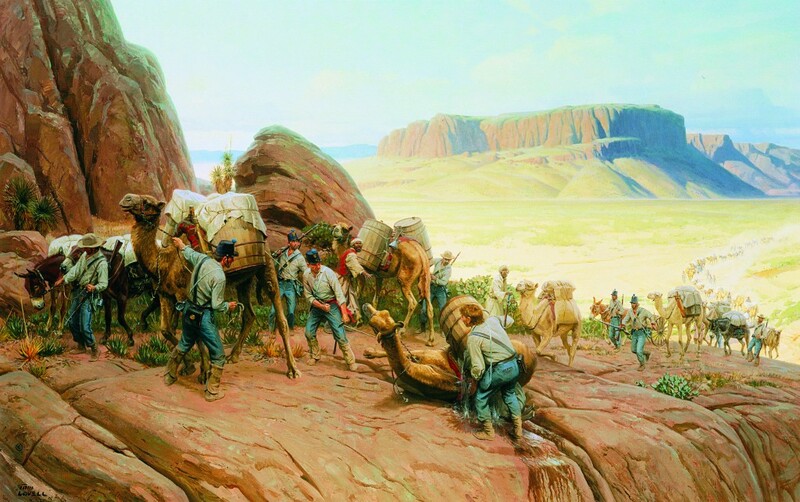 Although interrupted by the civil war the experiment was somewhat of a success, and a successful combat movement (By civilians) was even carried out on camel back. --- Perhaps we should rethink the concept of the IRON HORSE and develop an IRON CAMEL! Some of my most cherished childhood memories were the long yet perfect hours driving in the car with my dad down the dirt roads and winding roads along the Highway 50 in the middle of my home state of Nevada. I memorized all the Marty robins lyrics and all of his terrible jokes, which helped the loneliest highway seem not so lonely. For those who have been there, it's a beautiful place. U.S. Route 50 (US 50) is a major east–west highway, connecting Ocean City, Maryland and West Sacramento, California. Stretching 3,000 miles (4,800 km), the route runs through mostly rural areas in the Western part of US. It includes the section through Nevada known as “The Loneliest Road in America”. Do you remember the first one? The first ride you took that made you want to ride every day of your life for as long as you live... well this was mine. The Columbia River Gorge is perhaps the most beautiful place on earth (IMO), and it is no wonder why the US Govt. decided to build it's first most beautiful road along side this heavenly place. It's swooping roads and century old stone bridges span million year old waterfalls and breathtaking vistas that possess the magic to galvanize the soul of a biker and unify him with his motorcycle in a way that can affect a man's life forever. If you ever get the chance to ride this road... don't pass it up. You wont regret the decision. During a point in American history when our country was isolated from the rest of the world and learning to have its own identity, we started to take pride in the world around us and set apart the most precious parts of our country for recreation and enjoyment. This road was built for our recreation, and 100 years latter it still serves that purpose, and serves that purpose well. After 59 years of serving motorists in the United States, the American Association of State Highway and Transportation Officials decertified Route 66. The vote included the removal of all highway signs along the pathway. It was the interstate highway system, which was stated back in the 1950s, that spelled doom for Route 66. Drivers preferred the more direct routes, with more lanes and higher speed limits. Virtually all sections of Route 66 were completely cut out by the interstates. Interestingly enough, no other national highway from the original 1926 grid has been decertified. The famous “Mother of the Mother Road” didn’t become a part of Route 66 lore until 1941. She and her husband Carl bought a gas station and tourist cabins on a rural part of the road in Oklahoma. Because she was so rugged and self-sustaining, yet constantly lent assistance to motorists, she become legendary. Back when the famous American author took a trip from Chicago to the West Coast, inspiration struck. He drove on Route 66, the road he lovingly called “the long concrete path” and began to formulate a story that eventually took shape as The Grapes of Wrath. In his iconic American novel, the path west was called “Mother Road.” Many who lived in the Dust Bowl used it to find greener pastures in California, making it a symbol of the American dream. Today, some people still use that term for Route 66. Located among the deep green forests of northwestern California, Bigfoot Scenic Byway takes you through the region boasting the most sightings of Bigfoot of anywhere in the country. Whether you catch a glimpse of the elusive creature or not, a trip down the route rewards you with impressive mountain ranges, wild rivers, and recreation opportunities around every bend. Outdoor enthusiasts find activities both on and off the road, and kids in the backseat keep their faces pressed against the glass in hopes of adding their name to the lists of local sightings. Beginning in Willow Creek (known as the "Gateway to Bigfoot Country") and ending in Happy Camp, your trip provides an unforgettable experience in one of California's wildest portions. Bigfoot Scenic Byway's 89 miles travel through or pass near a variety of public lands, including several wilderness areas, two national recreation areas, and Redwood National Park. The small towns along the route are the perfect places to stretch your legs, learn more about local cultures, and stop in during one of the Sasquatch-related festivals held throughout the year. With its abundance of protected lands, the area provides exceptional wildlife viewing. Elk, deer, river otters, black bears, mink, bald eagles and peregrine falcons are among the animals sighted frequently in the dense forests. Outdoor enthusiasts find plenty to do along Bigfoot Scenic Byway, including whitewater rafting, mountain biking, and hiking. Backpackers especially enjoy the easy access to Marble Mountains Wilderness, where they can hop onto the epic Pacific Crest Trail for a few months or spend a weekend trekking among the Marble Mountains' eighty-nine glacial lakes. Though the drive can be made in a couple of hours its local legends, untrammeled natural spaces, and abundant recreation opportunities tempt travelers to alter vacation plans and stay a little longer. Hell Hounds, Gangs, Murders, Witchcraft, KKK - Just a few of the stories associated with this 10 mile stretch of Highway in NJ. RIDE AT YOUR OWN RISK! America is a big country, and with our love of the open road we haven't been shy about paving our way from one coast to the other. However, we don't often stop to think about just how many roads we have. According to Fun Factz, the U.S. has paved enough roads to circle the earth 150 times. A pervasive myth that has circulated for decades claims that one out of every five miles on the Interstate Highway System must be constructed straight and flat, to enable the landing of military aircraft in the event of war. Even the Federal Highway Administration admits the rumor is “difficult to dispel.” Several urban legend websites have all debunked the myth, with some citing the obvious faulty logic in using the highways as landing strips: in an emergency, wouldn’t the highways be more useful in moving people and vehicles than in landing aircraft? And if having such landing strips would be an advantage for U.S. forces, wouldn’t they convey an even bigger advantage for an invading force? The very first ever McDonalds opened on Route 66 in California: it was located on 14th and E Street in San Bernardino, CA. It opened on December 12, 1948. The McDonald brothers sold 15 cent hamburgers using a "Speedee Service System". Route 66 was not the longest U.S. Highway, the honor goes to U.S. 20, which spans 3,365 miles (5.415 km) making it the longest road in the United States. Along the Route 66 a World War II Prisoner of War Camp was located near Exit 146 on I-40 2 miles east of McLean, Texas. It operated between 1943 and 1945 and housed over 3,000 German prisoners.